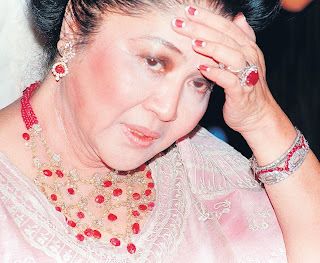 Imelda Marcos turns 80 on July 2, 2009 and told the Associated Press in an interview that “she is nearly broke”. “Here I am, at 80, still struggling to look presentable,” the widow of former Philippine dictator Ferdinand Marcos told the news agency in “her swank two-storey penthouse in Manila, wearing a dark red dress over matching pants and red slippers”. 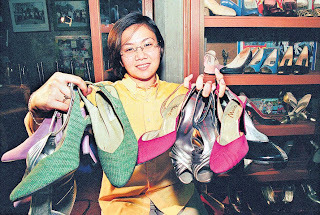 Imelda, whose shoe collection became a worldwide symbol of extravagance, and Ferdinand fled the Philippines in 1986 following the “people power” uprising, which installed Mrs Corazon Aquino as the next president. According to a 1990 news report, she left behind 508 gowns, 427 dresses, 71 pairs of sunglasses and 1,060 pairs of shoes. Nicknamed the “Iron Butterfly” during her 20 years as First Lady, Imelda was at one time known as the “Muse of Manila”. The way she had earned the title gave a fascinating glimpse into her philosophy of life: take EVERY opportunity that presents itself! She had entered the Miss Manila contest at the age of 20 but was not selected as a finalist. She felt crushed by the outcome and pleaded with the then mayor, accusing the judging panel of vote-rigging. The mayor, who was partial to pretty girls, fell for her charms and appointed her the “Muse of Manila” to cheer her up. Imelda continues to shock the world with her comments. The tone of her "broke" declaration is consistent with the general tenor of previous remarks. The following are a few examples. “Shoes are not even my weakness. Many of the paintings I bought were for our poor museums at home. As for jewels, I was blessed with a husband who was very generous to me,” – July 1990. “Before I had 3,000 pairs. Now the official count is only more than 1,000. Where have the rest gone?” – November 1991. “I will ask her what it is she is angry about, what it is I have done. If I have done something wrong, I will say I’m sorry and do what I have to do,” – November 1991. “I am so sorry for her and ultimately for the country. She had all this opportunity. Everybody wanted to give her a chance, and she blew it. – January 1992. NOTE: Imelda's collection of shoes is on display at the Marikina Shoe Museum. For more on Imelda Marcos visit this site. I can never be sure whether Imelda is really the deluded person she is, or whether it is all one big clever act. But she has made herself into an icon that - love her or hate her - makes her hard to ignore long after she has ceased to be the First Lady of her country.